About to tender / go to market? Are you about to begin the sourcing process / tender your requirements out to the market? 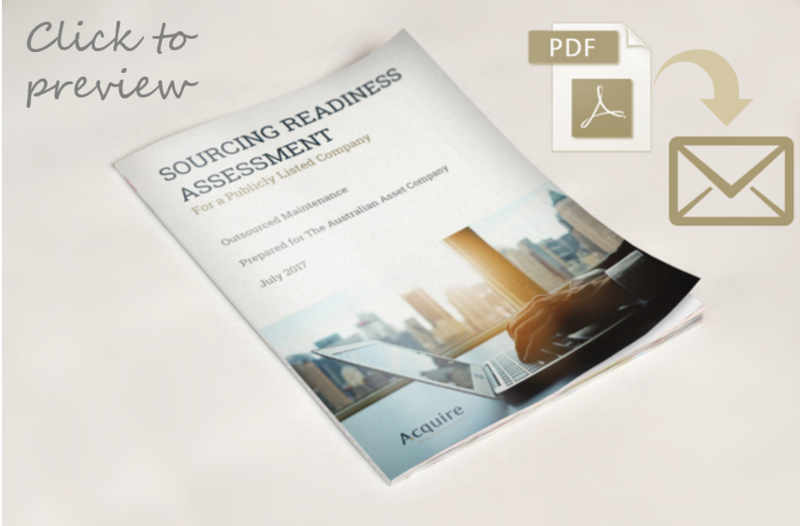 This Sourcing Readiness Assessment (SRA) evaluates your prepareness to manage the risks and unlock the most value when establishing or re-tendering a supply arrangement. Concerned you may pay too much? Your preparation has a significant impact on how much you are likely to pay. This assessment will prompt your thinking and guide you through the strategic sourcing process to ensure you don’t pay too much. Concerned your new supply contract could leave you exposed? There are many components to consider when sourcing / establishing a new supply arrangement. This assessment evaluates how exposed you are and, based on your answers, provides tailored suggestions as to how you can mitigate or minimise your risk. Not sure if you are truly ready? Sourcing your requirements from the market can be a complex and daunting exercise. Based on sourcing more than $10B of supply contracts over 10 years, this assessment provides you with confidence that you are ready to source or what specifically you need to do to be ready. Your personalised Sourcing Readiness Assessment (SRA) will be developed using your responses to questions that have been developed for sourcing more than $10B of products and services over the last 10 years. Once completed, your assessment will be emailed to you immediately – quick, easy and powerful.